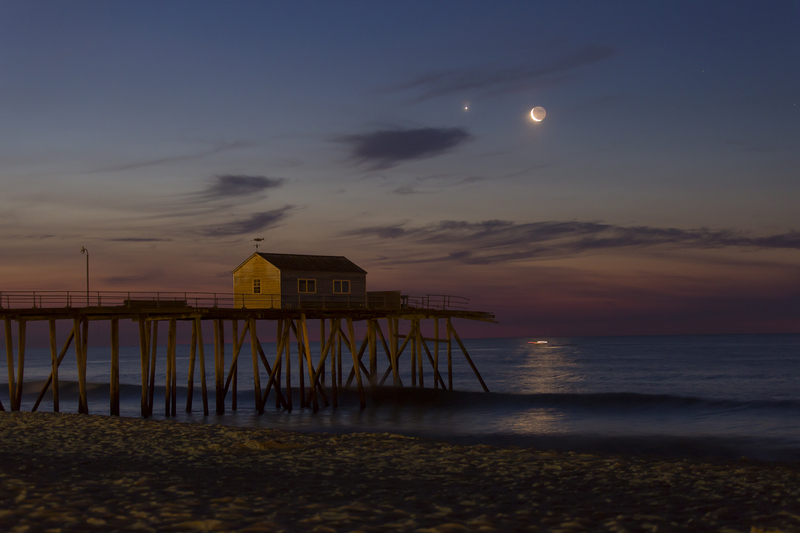 Explanation: Early morning risers were treated to a beautiful conjunction of Venus and waning Crescent Moon on June 24, captured in this seaside photo near Belmar, New Jersey, USA, planet Earth. The serene celestial pairing is seen above the Atlantic Ocean horizon as the eastern sky grows brighter with dawn's early light. Wispy, scattered clouds appear in silhouette. But the exposure also reveals the night side of the lunar orb in the arms of the sunlit crescent. That shadowed part of the Moon, with hints of the smooth, dark lunar seas or maria, is illuminated by Earthshine, sunlight reflected from planet Earth itself.